Three weeks before Christmas I got the call. It wasn’t the first time but this time it seemed different. More urgent. Mother called to let me know Dad was back in the hospital. It was a critical time in their lives – in more ways than one. They were in the process of selling their house; the one they purchased in 1956; the house I grew up in. Dad couldn’t keep it up any more. He had congestive heart failure – for the past five years. He was diagnosed at age 66 and was given 6 months to two years to live. Obviously, the doctors didn’t know my dad very well. Although he couldn’t walk very far, he could still drive. From their home in the Philadelphia suburbs, they would drive back and forth to Florida where they had become “snowbirds.” They would visit me and my family in St. Louis regularly. He did all the driving. Because my dad was a planner, my folks had bought into a retirement community outside of Lancaster. The plan was to sell the house in December and head to Florida as their new abode would not be ready until February. But my dad went back into the hospital. Somehow my mother’s voice was shakier this time. She’s been a trooper those past five years – carrying additional burdens and responsibilities with no family close by. I asked the question, and not for the first time. “Do you want me to come?” Normally the answer was no, she just wanted to update me. This time, “Yes!” I booked the first plane I could, landed in Philadelphia with friends (my mother’s BFF) waiting to whisk me to the hospital. My first question, “Is he still alive?” Yes, as far as they knew. The next three weeks were a blur. The house had been sold and the packers/movers were about to arrive. Dad hadn’t finished packing and mother didn’t know whether to pack his clothes or not. Everything would go in storage for the next several months. I couldn’t bear the obvious, so I insisted his belongings needed to be packed. This point in time was before cell phones were in every pocket. We were torn – home with packers or at the hospital with dad. We alternated. Then the home phone got disconnected. We were furious. We panicked. The phone company had shut off the service too soon and we could not be connected to the hospital. It took a bit of deliberate determination, but we got it turned back on. Mother had to go to closing on the house alone. The doctors were stumped as to why Dad was holding on. Although he was still conscious, he wasn’t always thinking clearly. And as the doctor said, “His blood pressure is 70 over nothing!” But, knowing my dad, he knew all was not in order. So, the realtor came to the hospital. Bless her heart. She showed Dad the check and said closing was done. We hoped he’d be able to let go. Nope. The doctor pulled me aside. He informed me that Dad had given instructions on his Health POA to be kept alive . . . The doctor wanted my permission to forgo that. My mother just couldn’t make the call. So I had to. Worst decision of my life! Not the wrong decision, just the worst one. And yet he held on. The house sold; the possessions were packed. Mother and I moved into a friends’ basement. Extended family showed up at the hospital. I loved clam chowder. The hospital cafeteria had the best. If I wasn’t sitting in the cafeteria with a bowl of it, I was sipping it from a Styrofoam cup in my dad’s room. To this day, I have not had any more clam chowder. I was becoming a bit frantic. Back in St. Louis I had two teenagers and a hubby waiting. Christmas was closing in and of course I’d done no shopping. Three days before Christmas I told my mother I needed to go home. My brother flew in from Colorado to take over. I said goodbye to my dad, I knew, for the last time although I just couldn’t grasp that. I cried all the way home. The day I left, he lost consciousness and three days later – on Christmas – he died. My dad was a good man. He was a hard worker and a strong provider. He was a responsible, accountable guy. He provided for us and took care of us the best he knew how to do. It wasn’t the ideal. But it was his best. He wasn’t the warm and fuzzy type. Our home lacked affection and I felt I could never live up to his expectations. But he was wise in so many ways. He taught me all about finances, manners, accountability, etc. And, in his own way, the only way he knew how, he loved me. I’m sad he never saw my kids grow up. He never got to reconnect with his oldest grandchild as we did, the one who had not been in our lives for so many years. He didn’t meet the grandkids’ spouses or get to know his nine great-grandchildren. He didn’t get to see how I finally turned out. Christmas is always bittersweet for me. But I’m blessed – and relieved to know where he is and that I’ll see him again. I’ll bet he’ll have a hug waiting for me. It has been a favorite vacation spot of ours for almost 20 years. We have scrimped and saved each year in order to visit there. “There” is Big Cedar Lodge, about four hours southwest of St. Louis, and ten miles south of Branson. When my kids were little, we took several fun visits to Branson itself – for rides and shows and such. Then one year, when the kids were in college, we visited Branson with my mother, a recent widow. She had heard that a new Lawrence Welk Theater had been built and all the “oldies” from the original TV show would perform. We secured front row seats. My mother was so happy, she cried. But back to Big Cedar. My dear friend MB suggested that while we were in Branson, we should drive around and check out Big Cedar Lodge. We did and we fell in love. It wasn’t difficult to justify trips there. We went four years in a row in the summer because my daughter worked at Kanakuk Kamps each summer and we celebrated her summer birthday with her. We also celebrated our summer wedding anniversary. Then, for a number of years we’d visit in February to celebrate hubby’s birthday. One year we treated my daughter, son, daughter-in-law and their baby and we all rented a cabin. We missed the last two Februarys so this year went for an early anniversary celebration. The experience did not let us down. 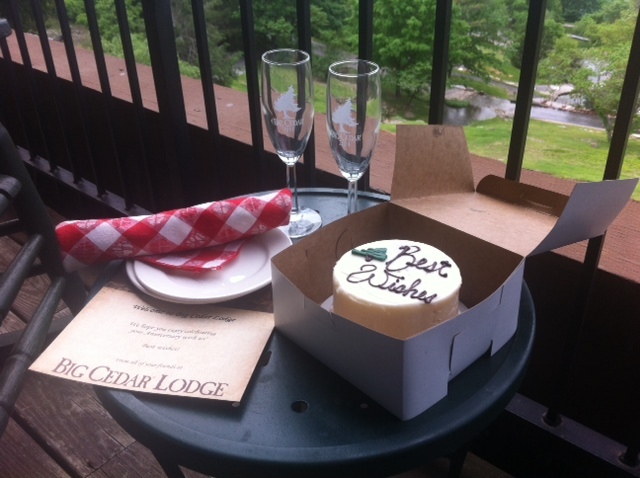 Big Cedar management always asks if we’re celebrating a special occasion. So we usually mention birthday or anniversary. We can always expect a token gift. During this visit, an anniversary one, true to form, when we arrived in our room, we were greeted with a card, a small cake and two Champagne glasses. It’s so fun. It occurred to me that over the years, I’ve accumulated quite a number of Champagne glasses. This was our seventh anniversary visit. That equals 14 Champagne glasses. FOURTEEN! Now, I’m not necessarily a teetotaler but I’m not all that fond of Champagne either. In fact, these glasses are used no more than once per year – at Christmas – mixed with orange juice! Mimosas! So I wondered: would they allow me to make an exchange for wine glasses (paying the difference, of course)? I followed up with my thought and yes, no problem. I’m thinking why hadn’t I thought about this earlier – I mean years earlier! Or at least four days earlier, before we took this trip. The nice gift shop lady explained that we could not trade in previous years as they were all dated. Well, I hadn’t remembered that point. In fact, when I came home, I checked all my Champagne glasses and sure enough, they were dated. All but two. Apparently, we have been visiting Big Cedar so long; we began before they began dating the glasses! So remember, this Christmas; drop in for a visit – and a Mimosa. But no more than twelve guests at a time please.